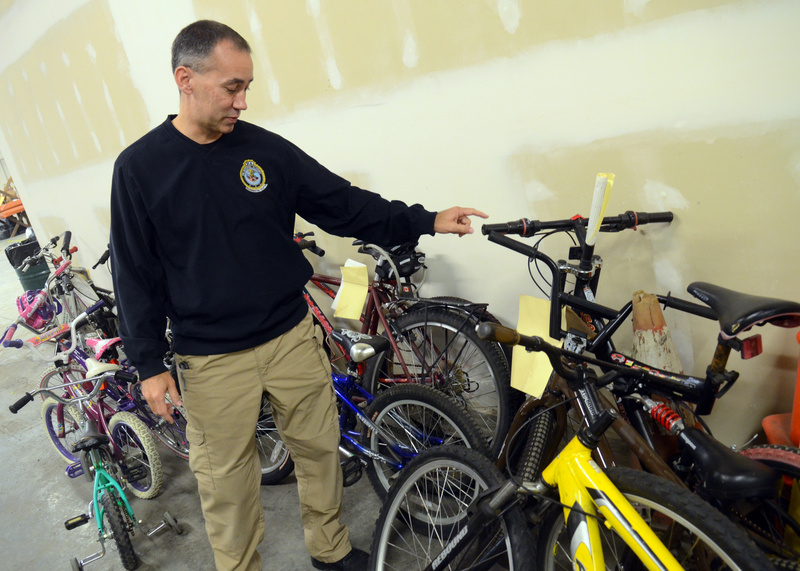 • Liberty Lake police Chief Brian Asmus recommends that people take advantage of his department’s free registration so that if a bike is found it can be quickly returned to the owner. Registrants just need to provide a description and serial number for their bike. • In Spokane, you can register your bike at your local COPS substation. The found bicycles are beginning to crowd the Liberty Lake Police Department’s evidence room, and plans are underway to donate the bikes to a nonprofit organization. Some are missing seats or wheels, but most of them are in excellent shape. There’s a tiny bike with training wheels; some designed for stunts; and a couple that police Chief Brian Asmus estimates are worth more than $1,000. “Most of these are found or turned in to us or to SCOPE,” Asmus said. A few were collected after people were arrested and never came back to claim the bikes. Asmus is puzzled when people don’t come looking for their missing bikes, particularly the ones that belong to children. “You’d think somebody would be missing this and someone would call us,” he said. Police must keep the bikes for 60 days. Most of those stacked at the police station have been there much longer. Strict rules govern most items found or collected as evidence, which must be destroyed or sold to the highest bidder if no claims are filed. But Asmus intends to take advantage of an exception that allows bicycles to be donated to a nonprofit organization. There has been interest in the bikes expressed by a couple of groups in the area, Asmus said. “The last time we did this, we gave them to Goodwill,” he said. Goodwill will likely get these bikes as well, Asmus said. The police department usually collects about two bikes a month during warm weather, he said. Asmus recommends that people take advantage of his department’s free registration, so a found bike can be quickly returned to the owner. Registrants just need to provide a description and serial number for their bike. Christ the King Church recently requested bikes for the Kidical Mass bike ride it helps organize. The number of bikes to be donated has not been determined, Cotton said.